The attempt to divide the State through publicity material has drawn sharp criticism from various quarters with the intellectuals demanding immediate withdrawal of the brochures growing shriller and apology from the organizers. 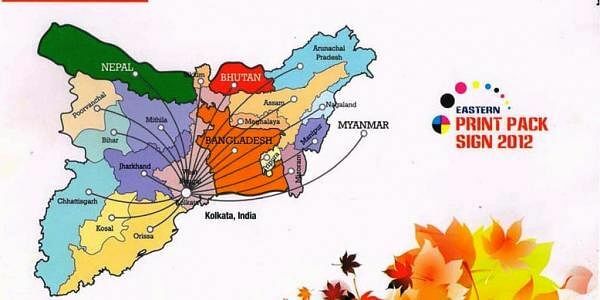 Close on the heels of reports on disfigured India map in the text books, the organizers of an International event to be organized in Kolkata were found distributing brochures with the map of Odisha divided into two parts. While one part has been mentioned as Kosal, the other as Orissa. The brochures were meant for second International Print and Pack fair - ‘Eastern Print Pack Sign 2012’ to be organized at Milan Mela exhibition ground in Kolkata from November 1-4. A designer and printer Bikramaditya Jena said the brochure has the details about the fair and appeals to take part in the event. “I was taken aback when I saw the map. It is clearly divided and while the western part has been marked as Kosal, the other part as Orissa. I immediately tried to contact the organizers, but they did not pick the call,” he said. Eastern Print Pack is one of the largest trade events in India, dedicated exclusively to the printing, packaging and signage industry. The latest news, views and market trends from this sector are closely analyzed during the show, which occupies the pride of place of being the biggest business event of its kind in Eastern India. Masters Printers Association of West Bengal is organizing the event and Pune based VNB International the managing partner. Claiming that it was a blunder on the part of the event organisers, the Balasore unit of Utkal Samilani has demanded an apology from the organizers in the media and action against them if they do not do so. Civil society activist Dilip Parida demanded that a case be registered against both the organizer and event manager for this "anti-national" act. “It is quiet surprising how could they dare to divide the map when there is no such immediate plan that the state would be divided. They have done it knowingly and hurt the sentiment of the people here. Action should be initiated against them,” he demanded. Meanwhile the event managers though admitted to have committed the mistake, but put the blame on a Mumbai-based designer. Nayan Vayani of VNB International said there was no such bad intention to divide the state. “The designer had inadvertently committed the error. Following the protests, we have withdrawn the brochures and destroyed it. We also have sent a written apology to the association members,” he added.